The 10-minute part is for real. 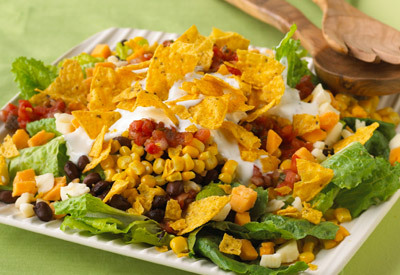 Throw this together fast for a hearty salad with fresh greens, corn, beans and Tex-Mex layers that stack up to fully loaded flavor! Top with next 4 ingredients. Drizzle with dressing; top with chips. Save 50 calories and 9g of fat per serving by preparing with Kraft Natural 2% Milk Colby & Monterey Jack Cheese Crumbles, Kraft Lite Ranch Dressing and baked tortilla chips. Substitute any canned beans for the black beans. TACO BELL® and HOME ORIGINALS® are trademarks owned and licensed by Taco Bell Corp.